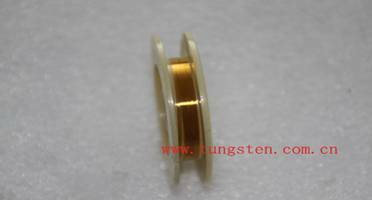 Definition of gold plated tungsten rhenium wire. Gold plated tungsten rhenium wire is namely tungsten rhenium wire plated with gold. Tungsten rhenium wire is a kind of tungsten wire, made with tungsten and rhenium. Gold plated tungsten rhenium wire has the properties of tungsten wire-- high temperature resistance, corrosion resistance, high melting point, low thermal expansion, and the property, which is superior to tungsten wire, that is tensile strength. When made tungsten rhenium wire, technicians add the element of rhenium in order to change tungsten wire's property—brittleness. Therefore, gold plated tungsten rhenium wire is much more tensile than gold plated tungsten wire. Gold plated tungsten rhenium wire has the surface condition of brightness because of the gold plated layer, which owns the color of gold. Gold plated tungsten rhenium wire is also smooth as black tungsten wire and cleaned tungsten wire.